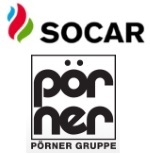 édité le 05/08/2016 - Plus de news de "Socar" - Voir la fiche entreprise de "Socar"
On August 2, engineering, procurement, construction and management (EPCM) contract on the construction of the new Bitumen Blowing Unit was signed with the Austrian Company ''Poerner'' at the SOCAR Oil Refinery named after Heydar Aliyev as part of the measures taken towards the realization of the reconstruction and modernization project of the refinery. Tofig Jafarov and David Mammadov, SOCAR Vice-presidents, Andreas Poerner, the Owner and Chief Executive Officer of ''Poerner'', Roland Stickler, Vice-president on contractual and commercial issues of ''Poerner'', Ute Friessner, the senior official of the Austrian Embassy to Azerbaijan were present at the ceremony held on this occasion. Speaking about the reconstruction and modernization project of the refinery, Vice-president Tofig Gahramanov emphasized the importance of the signed contract on Bitumen Blowing Unit, the first unit to be commissioned within this project and added that it will lead to the complete decommission of the existing infrastructure of ''Azerneftyag'', enable the optimization of the Refinery’s operating costs and commence the bitumen production of high quality and improve the ecological situation in Baku. Andreas Poerner, the CEO of ''Poerner'', expressed his contentment on opportunities for the further development of the mutual cooperation and added that he was proud ''Poerner'', possessing advance experience in this field, was selected as the EPCM Company for the construction of the new bitumen unit. It was stated that the new bitumen unit with the annual production capacity of 400 thousand tons will be commissioned in mid 2018. SOCAR is an integrated state oil & gas company of Republic of Azerbaijan and is involved in upstream, midstream and downstream operations encompassing exploration of oil and gas fields, production, processing and transporting oil, gas and condensate, marketing of petroleum and petrochemical products in domestic and international markets and supplying natural gas to domestic and industrial customers in Azerbaijan. SOCAR has its trading companies in Switzerland, Singapore and UAE and representative offices in a number of other countries. With over 40 years of experience in the process industry, Pörner employs more than 500 engineers and specialists at nine subsidiaries, in five countries. Voir la fiche entreprise de "Socar"
Les dernières news de "Socar"
Toutes les news de "Socar"